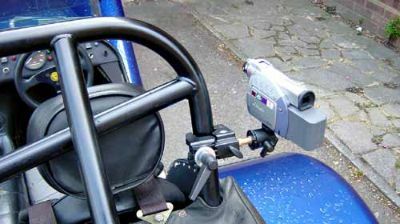 Bullet Camera - shown fixed to the roll bar with a Manfrotto clamp. Normally we would tape the cable to the roll bar, and tie-wrap the clamp to the roll bar - just is case. We have had great fun making videos of our exploits, mainly on track. 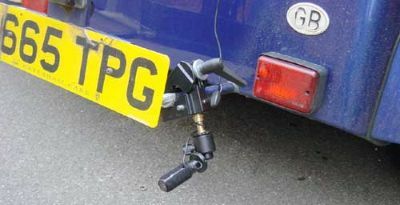 We started off with a video camcorder fixed to the roll bar with a clamp, but have now moved on to using a bullet Clamp, which is far more versatile and more suitable for the job. Bullet Cam - the wire is looped and taped to prevent strain. Note the tapped hole at the end - a standard camera mount size. Velcro added by us for unusual attachment options. Bullet Cam - what you get. We ordered the camera and a battery pack, as opposed to the kits that are available. Battery pack is taped up as batteries can pop out under high cornering loads! 8xAA batteries required. 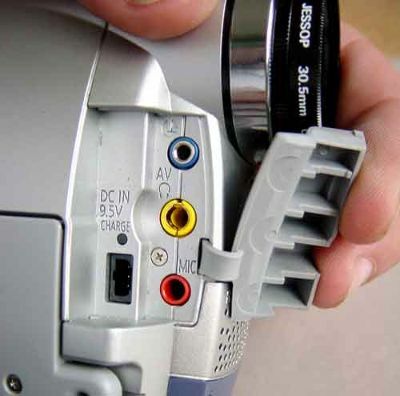 Canon MV500i - we had been using an old Sony camcorder, but as soon as we bought the bullet cam we needed to get a digital camcorder which had an AV socket (see below) These used to be very expensive models, but now cheaper camcorders have these plugs. This Canon was perfect for us - less than £400, but superceeded already! 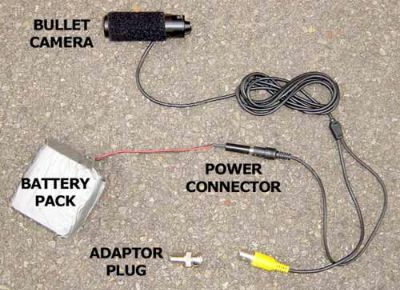 AV plug - this is the important one if planning to use a bullet cam. You can also see in this photo that I have fitted a 'skylight' filter to the camcorder lens. This filters glare, but also provides a replaceable protection to the camera lens. The bullet cam also has a replaceable lens protecting glass cover. Manfrotto Clamp - various combinations of this, but we bought the clamp section (bottom - about £15), the brass adapter fitting (£3)and the top fitting, a ball joint for fixing the camera too(approx £18). 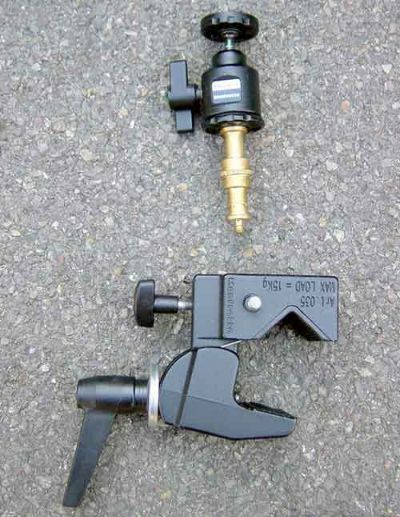 The clamp is actually designed for lighting rigs in theatres/studios etc, but clamps round a roll bar perfectly. We bought from Jessops, New Oxford Street, London. 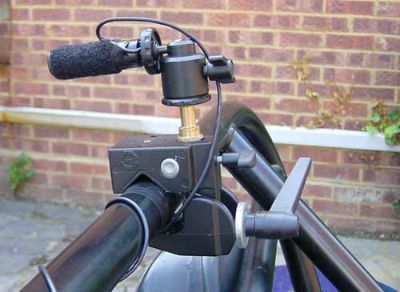 External Microphone - using a bullet cam cancels out the camcorders internal mike, so an external mike is required. Jessops - costs about £25 and uses 1xAA battery. You will need these adapters from Maplins or similar, to join microphone to the audio plugs from the camcorder. Bullet cam on a mount, microphone in the footwell, camera in the boot, with battery pack, well secured so it does not get flung around. All cables taped down. Bullet Cam in its usual place on the roll bar. 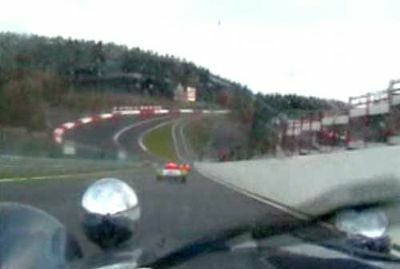 With this angle you can get the track and driver in the same shot, even if it is just the hands on the steering wheel. 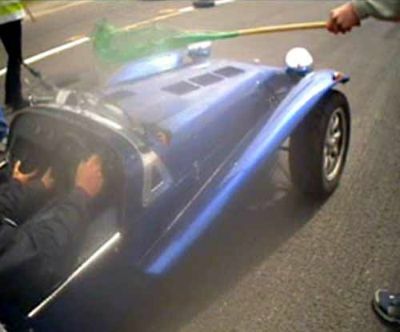 Better shots with a Brooklands screen than a windscreen. 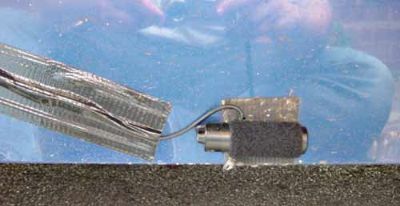 To avoid wind noise we attach the mike in the footwell, velcroed to the bulkhead. Remember to turn it on! The small size of the bullet cam allows experimentation. Here we have velcroed the camera to a velcro patch stuck on the bodywork. This photo is just for illustration purposes. We actually used more duct tape to secure the camera. View from the camera position shown above. 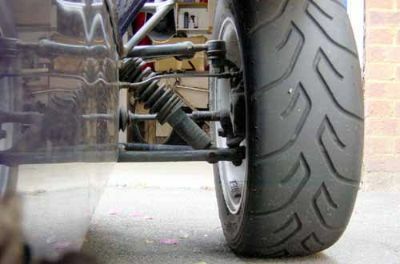 You get great shots of the tire flexing on track, suspension moving and damper - damping. Rear facing shot. I find this angle gives the best sensation of speed on track. Get a friend who knows the camera is there to follow for some great shots! This angle gave a surprisingly good shot, especially when the car went through a small flood! (Camera is fully waterproof) I tried this around country lanes one night - have not done so on track. Again, this shot is just to illustrate the idea. We fed the wire much more carefully, and used duct tape to secure, as before. 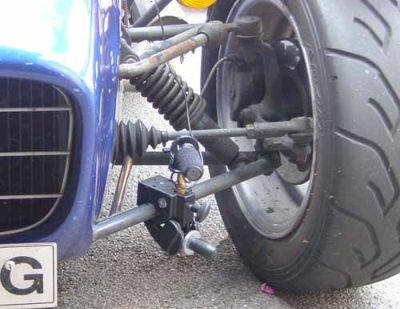 IF TRYING THE MOUNTING POSITION ABOVE YOU MUST MAKE SURE THAT THE CAMERA OR CLAMP DOES NOT INTERFERE IN ANY WAY WITH THE STEERING, AT ALL ANGLES AND SUSPENSION POSITIONS. 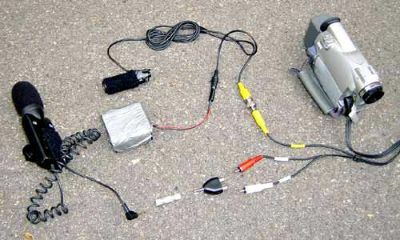 ALTHOUGH NOT SHOWN HERE, WE ALWAYS USE TIE WRAPS TO SECURE THE MOUNT, THE CAMERA AND ANY OTHER BITS OR EQUIPMENT. 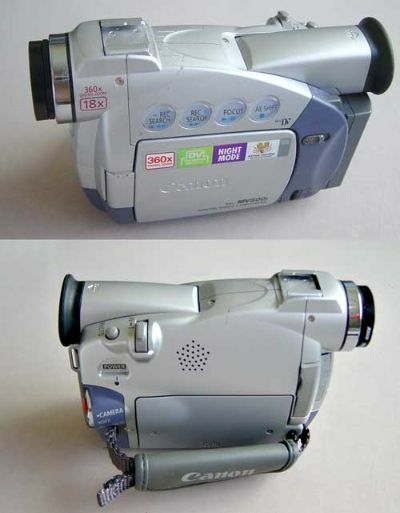 Before we got the bullet cam we just used a camcorder. 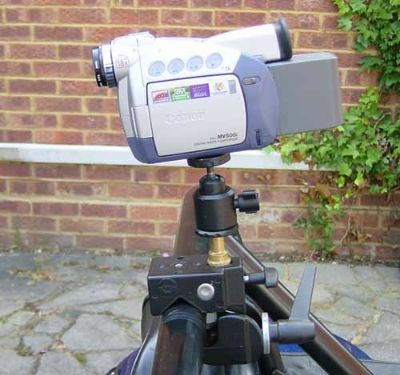 as you can see from this image, the camcorder is very vulnerable, both to stones, and damage caused by excessive vibration, cornering forces etc. The surface area of support is very small, which places a lot of strain on the camera's case, and internals. This second shot shows the camera in a slightly less vulnerable position. 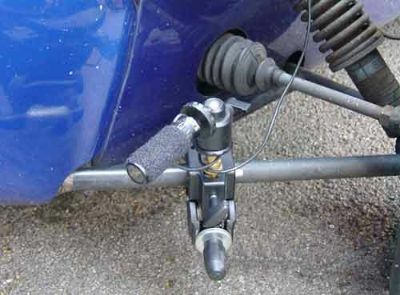 We ALWAYS used tie-wraps to hold the camera to the roll bar in case the fixing failed. 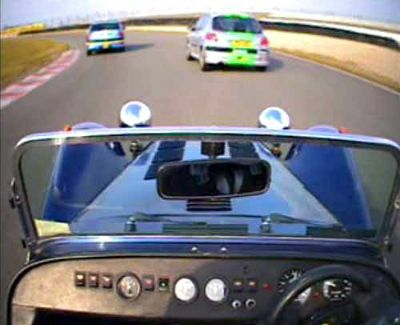 An alternative camera angle which gives a good shot along the car at drivers eye level. You can see how the ball joint provides great flexibility over positioning. 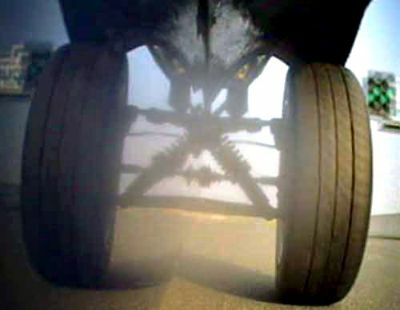 Here are some images that can be found elsewhere in the site, all taken with the bullet cam or camcorder. The image quality is far lower than the actual film. 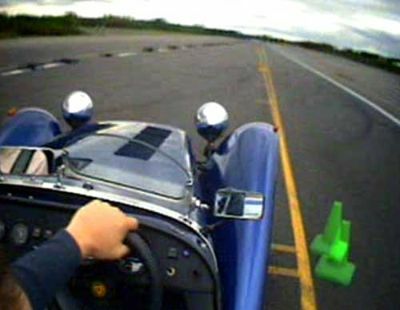 Croix en Ternois - Normal, roll-bar mounted bullet cam shot. 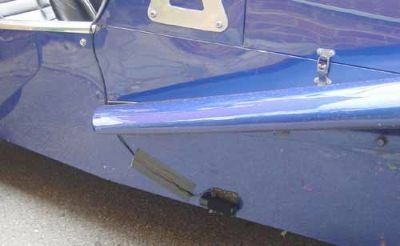 Brooklands '03 - Bullet cam taped to the end on a mono-pod, which was taped to the roll-bar! Be careful of hitting start marshals! Brooklands '03 - side mounted on the roll bar. 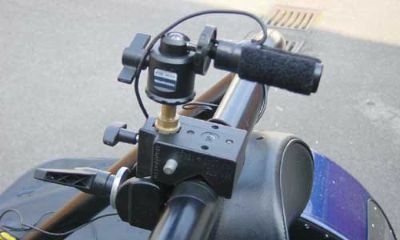 Croix en Ternois - side mounted bullet cam shot.